6:00 p.m. – 9:00 p.m. | Doors Open 5:45 p.m. In an effort to spotlight the rising violence and theft that recently has threatened many Oakland residents and the urgent need to protect residents from it, Make Oakland Better Now and the Metropolitan-Greater Oakland Democratic Club (MGO) have partnered to host the first mayoral candidate debate of the season on Thursday, April 3, 6:30 p.m., at Temple Sinai, 2808 Summit St. in Oakland. MOBN! and MGO have confirmed mayoral candidates Jason Anderson, Patrick McCullough, Bryan Parker, Jean Quan, Courtney Ruby, Libby Schaaf, Nancy Sidebotham, Dan Siegel and Joe Tuman will participate in the forum. “This debate will provide an opportunity for Oakland residents to hear the real views of the candidates about public safety solutions,” said Bruce Nye, president of MOBN! Local journalists Bob Gammon, East Bay Express; Matt Artz, Oakland Tribune; Chip Johnson, San Francisco Chronicle; and Bianca Brooks, Youth Radio will ask hard-hitting, probing questions. The debate is free and open to the public. RSVP for planning purposes at oaklandmayoraldebate.eventbrite.com. 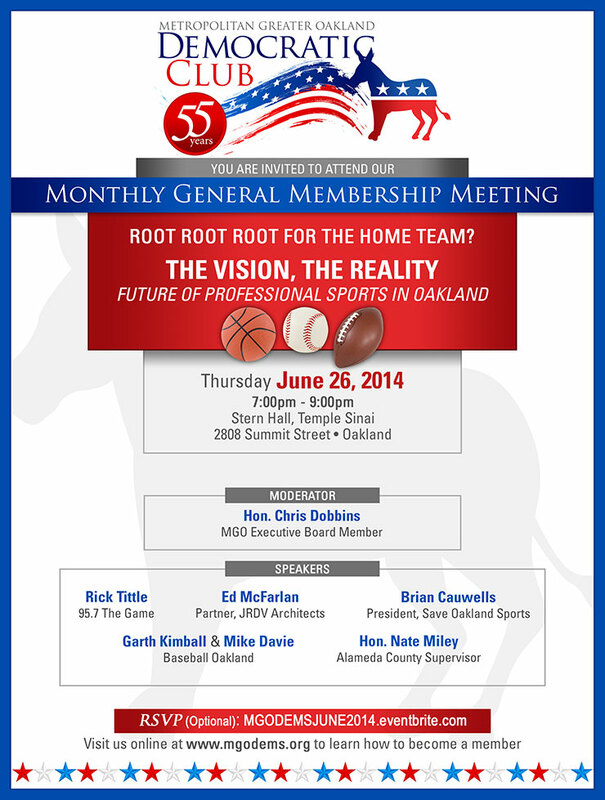 Join the Metropolitan-Greater Democratic (MGO) Club’s second program on the Oakland Army Base development with featured speaker, developer Phil Tagami, Chief Executive Officer of California Capital Corporation. Phil Tagami will discuss current status of transformation of a major portion of the base to a global trade and logistics center and its anticipated effect on Oakland employment. The plan is known as Oakland Global (go to http://oaklandglobal.com and click on the short video titled “Oakland Global–Logistic Cluster.”). The total funding currently dedicated to the project’s first of two phases is approximately $500 million. Phil Tagami is a lifelong resident of Oakland, where he resides with his wife and two children. He has been actively involved in the Oakland community for years as a business owner, an appointee to several state and local commissions, and a volunteer serving on the boards of directors of many organizations. Over the past 20 years he has managed millions of dollars of rehabilitation and new construction projects, both as a principal and as a consultant, and has been active in local/regional politics and policy making, serving on numerous commissions and boards.